People with the intact immune system generally do not develop symptoms of toxoplasmosis. However, the parasite may persist throughout its host life and there is a risk of reactivation of the infection at a later time if the individual becomes immunosuppressed, even if the infection has been asymptomatic or only mildly symptomatic initially. 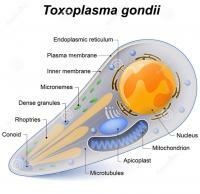 Most people only find out they have been infected with Toxoplasma gondii when doing blood tests. This is very common in prenatal women, as serology for toxoplasmosis is part of a pregnant woman's routine exams. Toxoplasmosis is asymptomatic in up to 90% of immunocompetent people (with a healthy immune system), however, there are healthy individuals who may have some symptoms. The most common clinical manifestation of toxoplasmosis is the appearance of painless lymph nodes (also called lymph nodes) in the neck region. These lymph nodes are usually smaller than 3 cm in diameter and well adhered to the deep planes of the skin. One-third of patients who develop symptoms of toxoplasmosis have generalized enlargement of the ganglia throughout the body. Constitutional symptoms, such as fever, chills and sweating, may be present. Headaches, muscle pain, pharyngitis are also common. Often the clinical picture is very similar to that of a swollen flu and the correct diagnosis goes unnoticed. Body reddish spots or hepatosplenomegaly (enlargement of the spleen) may also occur, making the condition similar to that of a mononucleosis. Most immunocompetent patients have a benign, self-limiting toxoplasmosis lasting weeks to months, rarely for more than a year, which disappears even without treatment. The enlargement of the ganglia also disappears over time, but in rare cases it may persist chronically. In immunocompetent patients, complications of toxoplasmosis are very rare. Pneumonia, myocarditis, pericarditis, polymyositis, hepatitis or encephalitis have been described as complications, but they are lesions that usually occur only in immunosuppressed patients. Chorioretinitis (deep eye infection) is an injury that can occur even in immunocompetent patients, although it is also a more common manifestation in immunocompromised individuals. Adults with childhood acquired disease or adolescence may present bilateral ocular involvement, scars and recurrences of the ocular lesion, which may progress to blindness. The infection acquired in the adult usually causes ocular pain and reduction of the visual acuity. 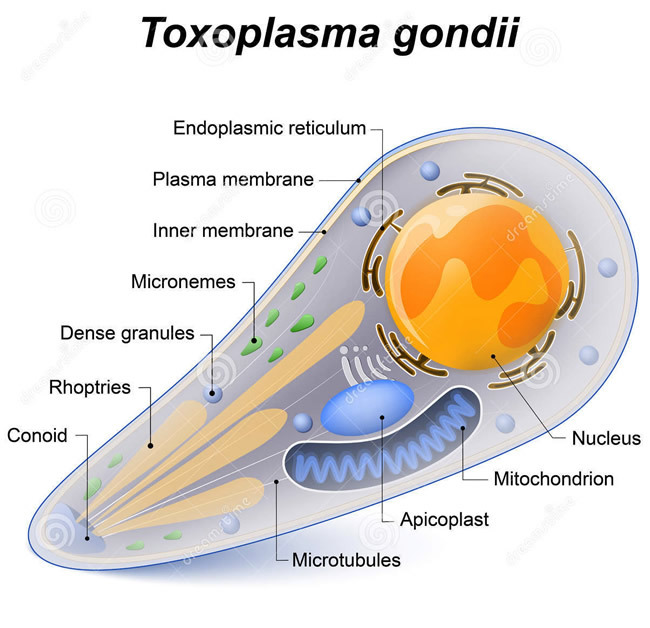 If in healthy people toxoplasmosis usually causes no symptoms, and when the cause is usually a mild and self-limiting picture, in immunocompromised patients, toxoplasma infection is much more serious. In immunocompromised patients, toxoplasmosis may be a newly acquired disease, but it is, for the most part, a reactivation of an infection that arose years ago when the patient still had the immune system intact. The parasite can be years in silence in the body, controlled by the immune system. When the immunity low, as in the cases described above, the parasite becomes active again, being able to multiply and attack its host. The reactivation of toxoplasmosis in immunosuppressed patients usually affects the central nervous system, leading to the formation of abscesses in the brain. Symptoms of cerebral toxoplasmosis include headaches, seizures, changes in speech, and loss of limb movements, resembling a stroke picture. Changes in the state of consciousness are also common, and the patient may develop into a coma. Another common lesion of toxoplasmosis in immunosuppressed patients is chorioretinitis, which causes pain in the eyes and loss of vision. Most patients who develop ocular lesions also have brain lesions due to toxoplasma. Toxoplasmosis can also lead to lung infections, coughing and difficulty breathing. Toxoplasma also causes myocarditis, inflammation of the heart, causing symptoms similar to those of heart failure. As there is no competent immune system to combat the parasite, toxoplasmosis can spread throughout the body, causing problems in the liver, pancreas, intestines, bone marrow, bladder, etc. If left untreated, toxoplasmosis progresses to sepsis, with a high risk of death.